The first exoplanet was spotted in 1988. Since then more than 3,000 planets have been found outside our solar system, and it’s thought that around 20 percent of Sun-like stars have an Earth-like planet in their habitable zones. We don’t yet know if any of these host life – and we don’t know how life begins. But even if life does begin, would it survive? Earth has undergone at least five mass extinctions in its history. 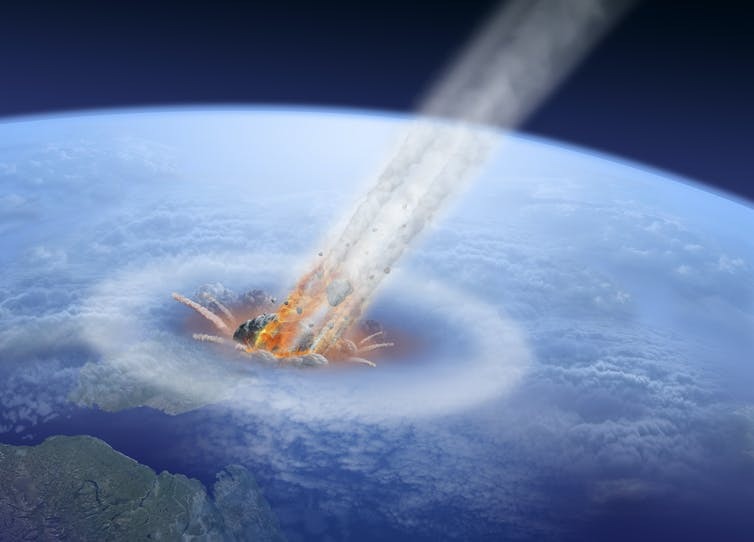 It’s long been thought that an asteroid impact ended the dinosaurs. As a species, we are rightly concerned about events that could lead to our own elimination – climate change, nuclear war or disease could wipe us out. So it’s natural to wonder what it would take to eliminate all life on a planet. 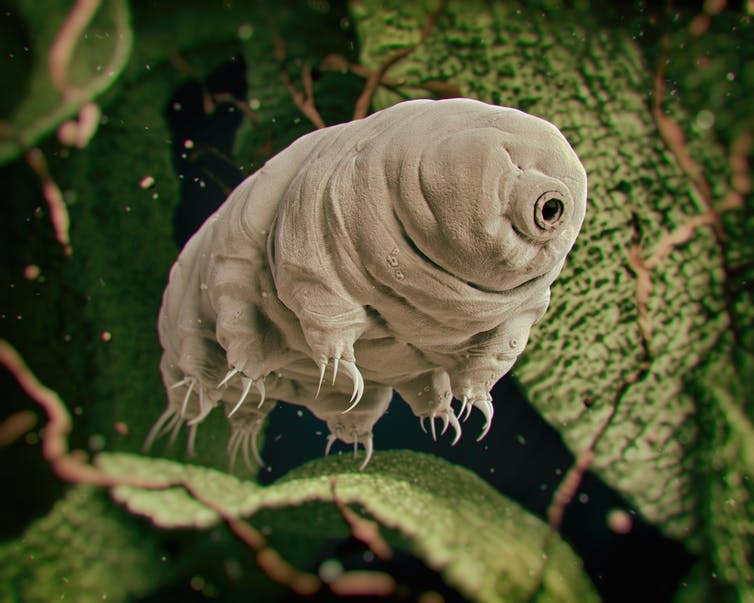 To establish a benchmark for this, we’ve been studying what is arguably the world’s hardiest species, the tardigrade, also known as the “water bear” for its appearance. Our latest research suggests these microscopic, eight-legged creatures, or their equivalents on other planets, would be very hard to kill off on any planet that was like Earth. The only astrophysical catastrophes that could destroy them are so unlikely there’s an insignificant chance of them happening. This extreme survival ability adds weight to the idea that life is hardy enough to be found on other planets less hospitable than our own. Tardigrades are known to survive incredible conditions. Drop the temperature briefly to -272℃ or raise it to 150℃ and they go on. They live all over the planet but can survive far below the ocean’s surface, around volcanic vents at the bottom of the Mariana Trench happily oblivious to the life and death of surface-dwelling mammals. Stripping the ozone layer or upper atmosphere would expose humans to lethal radiation but, at the bottom of the ocean, the water overhead would provide shielding. We wanted to consider what cataclysmic events might be able to finally kill off the hardy tardigrade. What would need to happen to destroy every living thing on the planet? The simplest answer is that the planet’s entire oceans would have to boil. On Earth, this would require an incredible amount of energy—5.6 x 1026 joules (around a million years’ of total human energy production at current rates). We therefore have to consider the astrophysical events that could provide such an enormous amount of energy. There are three primary candidates that could do this: asteroid impacts, supernovae and gamma-ray bursts. Of these, asteroids are the most familiar. We’ve been hit by several over the course of Earth’s history. But, in our solar system there are just 17 candidate objects (including dwarf planets like Pluto and Eris) large enough to provide this energy—and none with orbits coinciding with that of Earth. By looking at the rate of asteroid impacts on Earth, we can extrapolate the rate at which doomsday events like this would likely occur. This turns out to be approximately once every 1017 years—far longer than the life of the universe. So it’s very, very unlikely to ever happen. Supernovae (massive explosions of stars) release huge amounts of energy–1044 joules, which is more than enough to boil our oceans. Fortunately, the energy delivered to a planet rapidly drops off the further away it is from a supernova. So for the Earth, sterilization would require a supernova to occur within around 0.013 light-years. The nearest star apart from the Sun, Proxima Centauri, is 4.25 light years away (and is the wrong type to go supernova). For Earth-like planets in our galaxy, the distance between stars depends on their distance from the galactic center. The central bulge is more densely populated than our neighborhood. But even closer in, given the rates at which supernovae occur, sterilization is unlikely to happen more than once in 1015 years, again far beyond the age of the universe. Finally, there are gamma-ray bursts, mysterious explosions producing enormous amounts of energy focused into jets of radiation as narrow as a couple of degrees. Analyzing these bursts as we did supernovae, we found that they could only kill off life on an Earth-like planet if their origin was within about 42 light-years and the planet lay within the beam. Again, the rate at which this would occur is sufficiently low that very few planets would ever be sterilized by a gamma-ray burst. Given how tiny the chances are of any of these apocalyptic events actually happening, we’re left with the conclusion that tardigrades will survive until the Sun expands about 1 billion years from now. One final, incredibly unlikely possibility is that a passing star could kick a planet out of its orbit. But, even then, volcanic vents that host some tardigrades could potentially provide heat for long enough for the planet to be captured by another star. There are many events, both astrophysical and local, that could lead to the end of the human race. Life as a whole, however, is incredibly hardy. As we begin our search for life away from Earth, we should expect that if life had ever begun on a planet, some survivors might still be there. Regardless of what happened someone would complain that it was overkill, or too late, or too soon or completely unnecessary. Trump colluding with Russians did it. “What Would It Take to Wipe Out All Life on Earth? Enviro-whinerism and various other flavors of Liberal Progressive Socialist Globialist derpitude. Progressivism reveals the evils of society to be the consequences of capitalism, technology, and reason itself. Civilization is alienation from nature creating inequality among all men. Progressive mentation in all of its forms – Snowflake life, free money, immunity to law, perversity of love, denial of objective knowledge – marks the downward spiral to Hell of civilization. You know Unc, if you think in a higher plane (which I know you do), a good old fashioned mass extinction is probably just what this planet needs. If God loves the poor, crippled, stupid, diverse, perverse, insane, obese, addicted, starving, diseased, pigmented, Progressive, Muslim and Catholic, then God can firetrucking well pay for them or take them back. My wallet is broken. Unfortunately He wouldn’t take a disciple of Mammon. You really hid the fact that you are a complete idiot. If you can’t kill off Tardigrades, who don’t have the common sense to come in out of the (cosmic) rain, maybe I’ll think twice about trading in my SUV for a bicycle, after all! But the oceans will boil when the sun starts inflating into a red giant, so let’s not say “never”. I have a terrace, slightly below grade covered in patio stones. For 6 years I have been trying to get rid of the moss and weeds that comes up between the bricks. I have tried everything, and over the years (I confess) have dumped industrial quantities of weedkillers and herbicides, I have spent a fortune on this stuff and even illegally brought the strong stuff over the border. A little rain, and sun, and it all comes up smiling again 2 weeks later. Don’t tell me that life hangs in a fine balance. It is damned persistant, resistant and defies this man’s best efforts to poison it’s little spot on the planet! Abandon a farm, and 50 years later all that’s left is a pile of stones, and you’ll have trouble even finding those in the underbrush! Have you tried quats, quaternary ammonium disinfectants? Various linoleum cleaners (Lysol) have a nice fat dollop on the label. In a pinch, waterbed conditioner, Second shot is straight chloriine bleach. Third shot is dilute copper sulfate in water. I’m not an Organic Chemist, so I don’t see this stuff where I shop. “The Mall”, as a local distribution center, does have its limits! I should add I’m not able to make a dent in the insect life that makes its own home around the patio, either. That “Silent Spring” stuff is bunk, and I’m beginning to wonder if banning DDT is really worth the deaths of the 250,000,000 million or so who have died from Malaria, since! What would it take to wipe out all life on earth? uh…humans. Though the article discusses asteroid impacts, it doesn’t mention the type of impact that could really wipe the slate clean — a very large, very massive, or very fast object. We have indirect evidence of the first in the form of the Moon, which according to the prevailing, formed from debris when an object at least the size of Mars collided with the early Earth. This would have been about 100 million years after our world formed, so possibly there was no primitive life yet on Earth. But if there was, this collision would have hit the reset button for sure. A smaller, but very massive body like a neutron star or black hole could practically turn Earth inside out in a direct impact. Finally, an impact with something in smaller than the dinosaur killer, but moving at relativistic velocity (90% or more of light speed) could release enough energy to completely sterilize the Earth’s surface, though it’s hard to imagine a natural object accelerated to this speed. These scenarios are probably in declining order of likelihood in the same order as presented, with even the first scenario unlikely to recur prior to the Sun leaving the main sequence and becoming a red giant. However, they aren’t impossible, so even tardigrades could one day face Armageddon.